A leading CSU dentistry student has been awarded a scholarship from a prestigious international dental organisation. A leading Charles Sturt University (CSU) dentistry student has been awarded a scholarship from a prestigious international dental organisation. After careful consideration by a professional selection panel, Region VIII of the Pierre Fauchard Academy (PFA) has awarded a PFA Foundation scholarship to fourth-year student Ms Stephanie Hollis (pictured left) in the CSU School of Dentistry and Health Sciences in Orange. 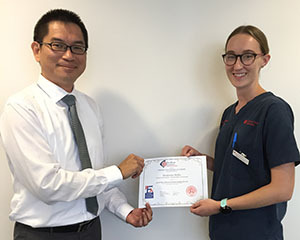 Head of the School of Dentistry and Health Sciences Professor Boyen Huang (pictured with Ms Hollis) said Ms Hollis was an outstanding student and worthy recipient of the scholarship. “We are delighted for Stephanie, and thank the Pierre Fauchard Academy for its interest in the School and its support of our students,” Professor Huang said. Ms Hollis, who comes from Fishing Point on Lake Macquarie south of Newcastle in NSW, said it was a surprise and an honour to receive the PFA scholarship. “I was very grateful to be nominated to apply for the Pierre Fauchard Scholarship, and feel honoured to represent Charles Sturt University as the recipient,” Ms Hollis said.